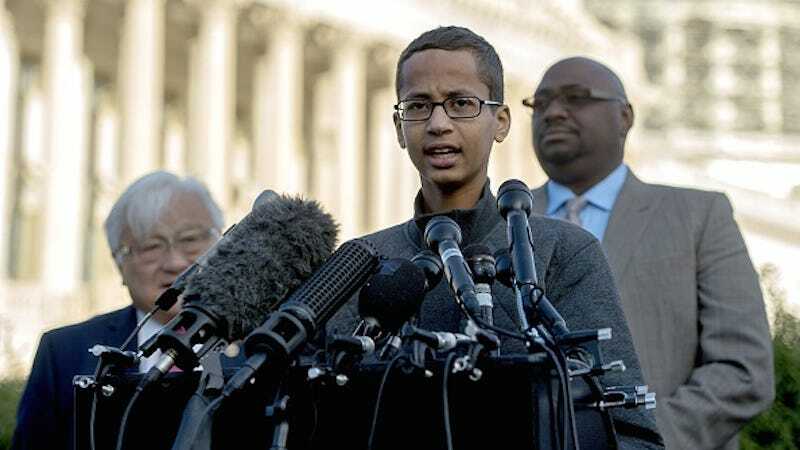 On September 16, 2015, 14-year-old Ahmed Mohamed was arrested for bringing a homemade clock to school because, according to his school principal, the device looked like a bomb. As of Friday, December 4, the Department of Justice has begun investigating whether the teenager’s civil rights were violated. When police arrived at Mohamed’s school in Irving, Texas, they quickly ascertained that Mohamed had not brought an explosive to school. However, he was nonetheless arrested for what they referred to as a “hoax bomb.” Mohamed, wearing a grey NASA tee-shirt, was led away in handcuffs. Mohamed now attends school in Doha, Qatar, where he moved with his family after being offered a full scholarship by the Qatar Foundation. Contact the author at rachel.vorona.cote@jezebel.com.